Home / SUPPLEMENTS / Do You Really Need Protein Powders? There’s no way in heck you can go to the gym without hearing about protein powders. Made as a shake or consumed in some other way, they’re getting more and more popular each day. You can buy them in every nutrition store around and the Internet is crawling with numerous suppliers. But we’re getting ahead of ourselves, what exactly is protein, to begin with? Proteins are organic molecules made up of amino acids. These amino acids like to hang out, so they meld with the help of chemical bonds, and then fold in different ways – creating structures that are paramount in our body functionality. And remember that there are two types of amino acids: EAA (essential amino acids) and BCAA (branched-chain amino acids), and the first ones your body can’t produce on its own, so we need some allies – supplements. 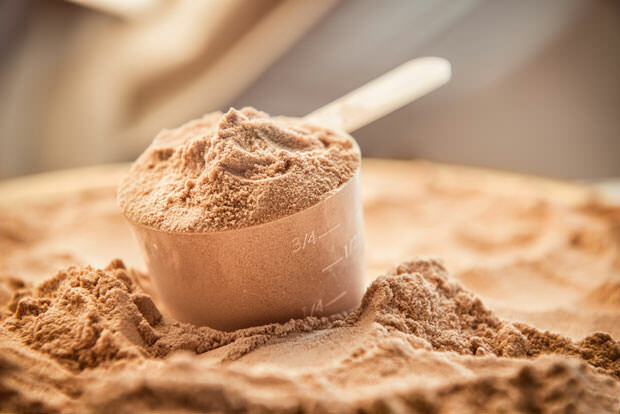 Protein powders are nutritional supplements that are most commonly made into shakes, either purchased premade or as powder you mix with whatever liquid you choose. There are three common forms of powdered protein and they are whey, soy, and casein. Whey proteins are the most popular and pretty much every bodybuilder consumes it (or at least knows about it). Whey, despite many a layman’s opinion, isn’t just some powdered fuel that big-bodied blokes smother their faces in and then frantically lift weights for days. No, that’s cocaine, and it doesn’t last that long, and it’s very bad for you in general. Whey protein is simply an addition to a good, quality workout and a diet full of lean protein, fiber and vitamin-rich fruits and vegetables – it just makes you even better, nothing else. It’s also a complete protein with all the advantages, like for instance all nine of the amino acids every human needs to have a normal diet. Whey is usually used in the morning as it’s the fastest-absorbing protein, and your muscles are very hungry for protein in the morning. Casein on the other hand is the slow protein, but immensely effective if timed right. It has this unique ability to provide your bloodstream with a steady flow of amino acids that can last for ours. It doesn’t build muscles overnight, but it’s the best protein option to drink before bed. Combining your supplement intake and shuffling it between whey and cassein has been proven by many studies to be the best option for gaining muscle mass. Cassein is also phenomenal for fat loss!